MDF File Repair Tool helps you to recover all tables, functions, stored procedure, views, triggers, rules, associated Primary key, Unique keys, data types and all other elements of SQL database. SQL Recovery Software allows you to recover SQL Server database using two scanning modes. You can select Quick scan option if the MDF/ NDF file is less corrupted and Advance scan option for highly corrupted database files. 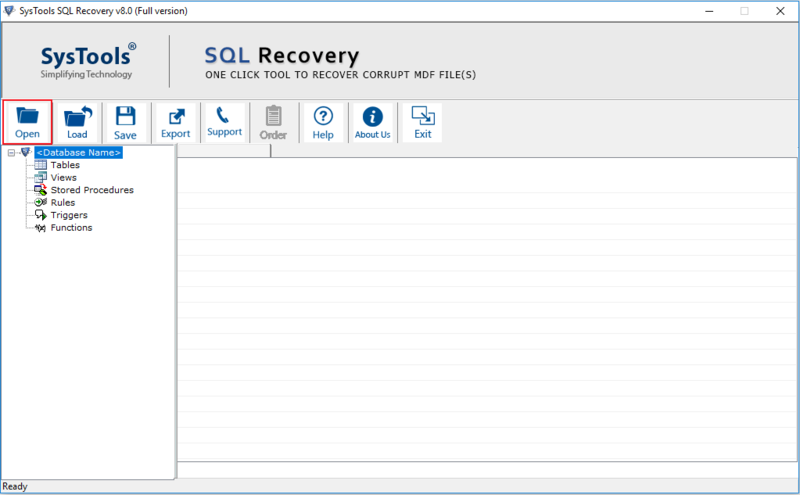 SQL Recovery tool recover primary database file i.e. MDF file as well as secondary database file i.e. NDF file. 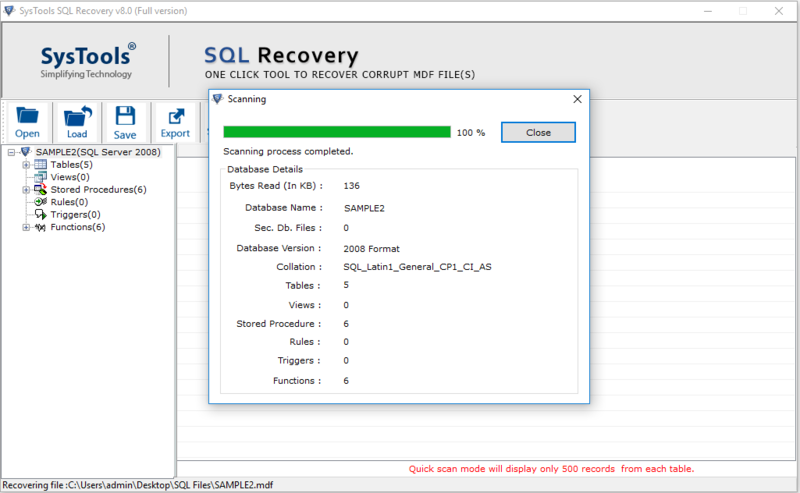 SQL MDF Recovery Tool scan both the files and recover data from deleted database objects. SQL Database Repair Software recover data from SQL table’s if it get deleted unknowingly or accidentally. This tool will help you to recover most of the deleted SQL database tables. MDF file Recovery software provide support to recover keys along with database tables. Both Primary key and foreign keys are supported by this utility after database export is performed. This tool offers to support latest SQL server 2017 & all its below version. It does not only recover SQL Server database but can also export it to SQL database of 2017 version. The database tables with standard and user defined schemas are supported as well as exported. SQL Recovery Tool supports to recover the database even if the corresponding tables contains user-defined schemas. MDF File Recovery software being a Windows based application, supports all Windows OS versions including the latest Windows 10. Apart from it, this application supports both 32 and 64 bit versions. 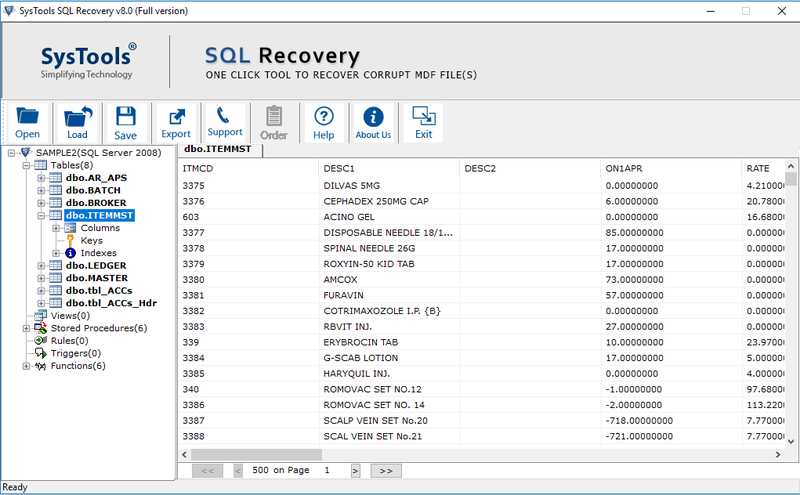 SQL Recovery tool generates a preview of all scanned and recovered database items like columns, keys, tables, indexes, triggers, functions, procedures with item count with its in-built viewer. When the scan of both MDF and NDF files is performed, it provides you an option to save the scan as .str file. You can save that scan to the desired location. This option helps you to save the scan time if the loading process is closed in between. 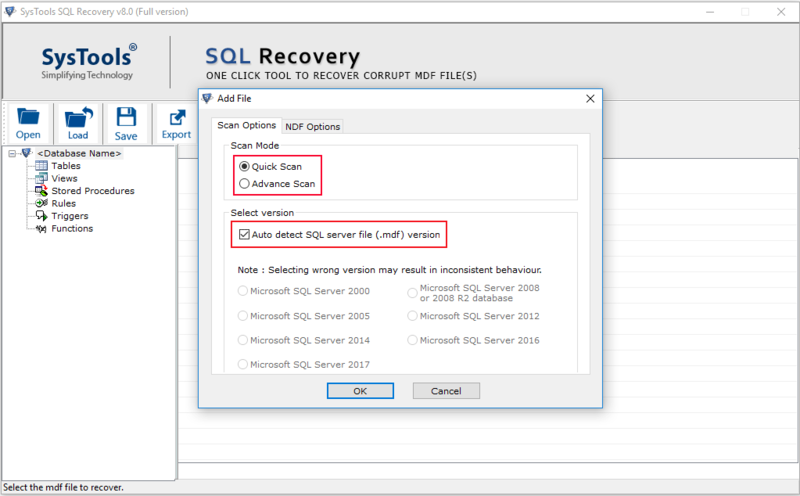 This SQL Recovery tool is smart enough to auto-detect the version of MDF and NDF file of the SQL Server. But, if you know the actual version of the SQL Server then it is recommended to manually check the appropriate SQL Server version. This export option comes in help if you want to move the files directly into the live SQL Server database. The only thing which is required is the database credentials like Database name, Server name, Username, Password, etc. MDF Recovery Software allows you to export database with schema of selected files, procedures only. On the other hand, you can export the tables with both data and schema in it. As files are exported to SQL Server compatible script, a .sql file is created which can be easily stored on any machine and used to recover data from SQL server. 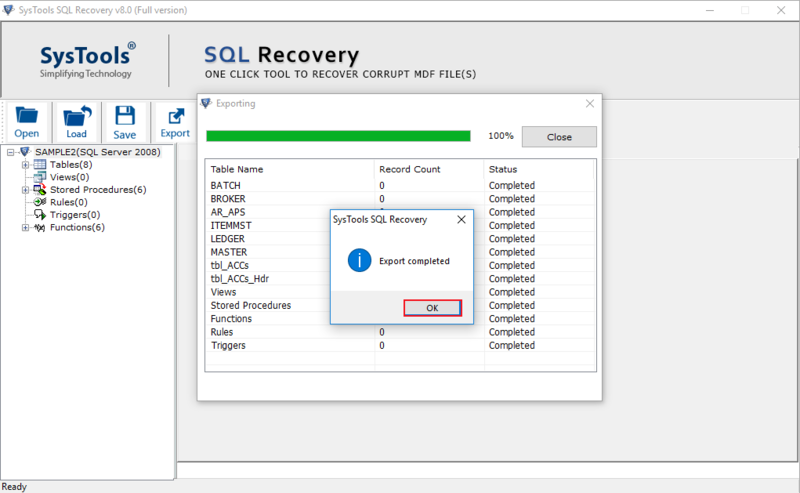 SQL Recovery Tool allows you to recover XML data if the columns and variables are created of XML type or the XML documents are stored on SQL Server database. SQL MDF Database Recovery Software is able to recover Database in SUSPECT mode. If you are not able to connect with the database due to file SUSPECT error then you can recover and repair your SQL database by this utility. 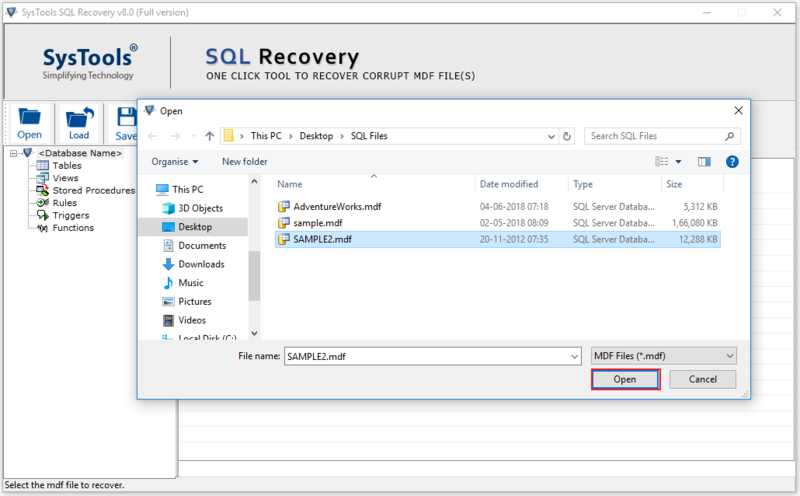 SQL Database Recovery software has an option to export only the selected items from MDF or NDF file and save it. MDF File Recovery tool lets you check or uncheck the files and folders. SQL Recovery Tool supports advanced data type to recover MDF database file which includes Datetime2, datetimeoffset, sql-variant, hierarchyid, geography and geometry data types. Moreover Unicode and ASCII XML are also supported. Hard disk space : 100 MB of free hard disk space required. 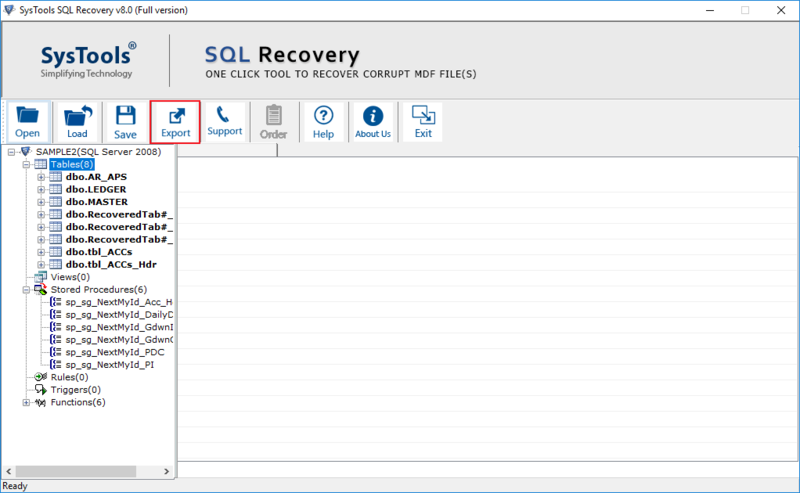 Demo version of SQL Recovery software provides a preview of recovered components of SQL database file and gives you option to export 25 records of each table. Is there any file size limit to recover corrupt MDF file? No, SQL Recovery Tool does not enforce any file size limitation. It can scan and repair MDF file of any size. How many NDF files can I recover at a single time? SQL repair Tool can scan and recover only single NDF file at a time but can add multiple files at a time for scanning. Is it necessary to install SQL Server on my local machine to use this tool? No, this MDF File Recovery Software does not require any SQL Environment availability on your machine for scanning MDF file. But if you want to export the scanned files into SQL Server database then you will require SQL Server Environment on your system. 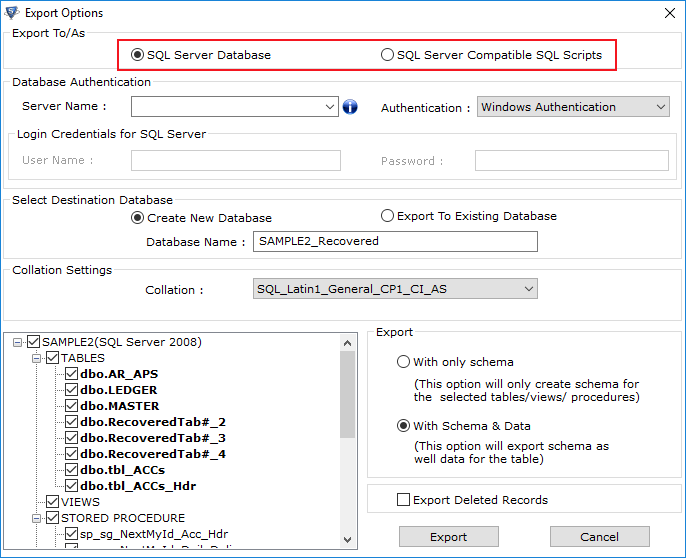 Does this application supports database created on SQL Server 2017? Yes, the application’s latest version can recover SQL Server 2017 database file & all its below version. How can I load saved scanned file? If you saved your last scanned session as .str file then you don’t require to scan it again next time to open the same .mdf file. Instead, you can directly load the saved .str file and can save your time. How can I restore the repaired file on my SQL Server? You can export the SQL database files directly into the SQL Server using Export to SQL Server Database option. It only asks for the Server credentials and you must have the full admin rights on SQL Server. Does this SQL Repair tool work for “Suspected Database” successfully? Yes, MDF File Recovery Software works for all type of corruption issues. Recently I got an email from an unknown source with an attachment subjected as “Bill Payments” and I opened that attachment accidentally. After that when I checked my database, all my database MDF files got encrypted to some .wallet extension. I was so worried about my data and wanted to restore corrupt MDF file. Then one of my friends suggested me this MDF Data Recovery Software and after using this tool, I got all my corrupted data back. MS SQL Recovery Tool worked for me when I failed in all angles. I have searched for some manual approaches but they had a risk of data loss. After a lot of searching, I got this tool and it had some unique and amazing features that helped me to choose this application. 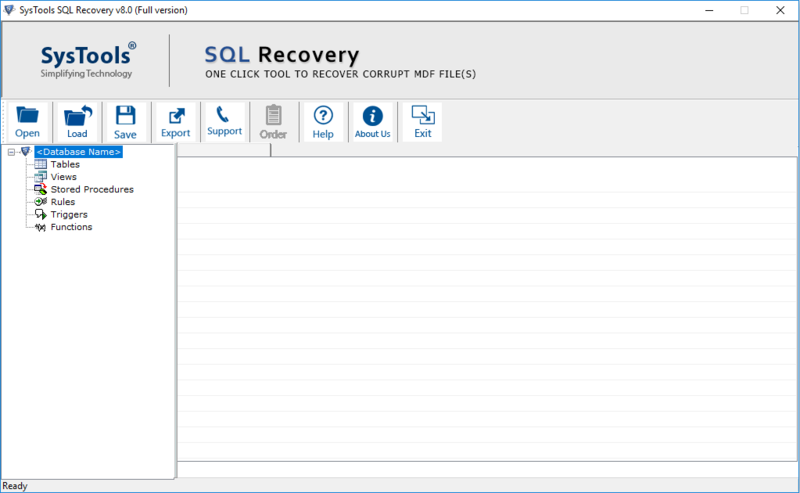 SQL Server Recovery tool is a brilliant product for all the users who are facing issues regarding SQL errors and wants to repair MDF files effortlessly. This application saved our lot of time and efforts. Big thanks to the development team. Step 9: Click on OK button once the recovery process get completed.